If you grew up in Thames, you probably went swimming at the 'Booms' - an area of the Kauaeranga River just past the Thames Racecourse, as you proceed up the Kauaeranga Valley. In more recent years a new housing development was named 'The Booms' located on the hill above the Thames Parawai Racecourse. 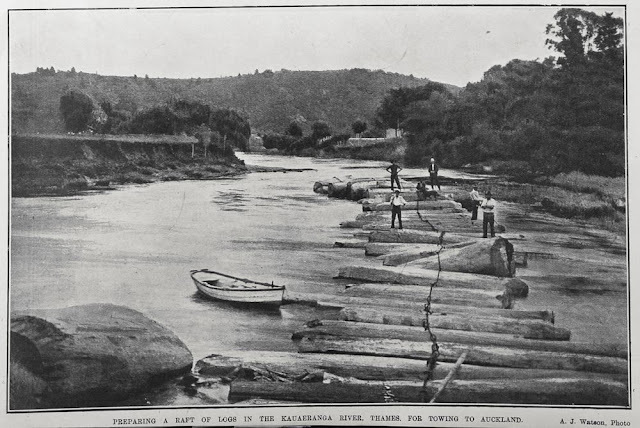 There is a new article by David Wilton in the Treasury Journal on the "BOOMS FLAT" which reveals there is much more to the name, and what took place in order to bring the Kauri logs down the river to the sea. "This article describes sites identified and recorded around the Booms Flat area (the name 'Booms Flat' now applying to a DoC campground near the old Main Booms)." 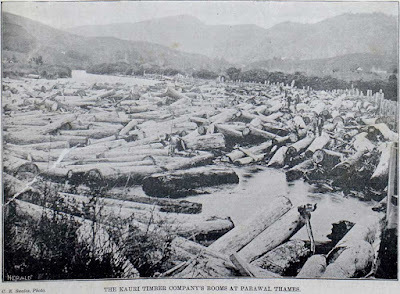 The logs were collected in the Parawai Booms until they could be prepared and taken to Auckland. The logs were typically tied together and towed to Auckland. 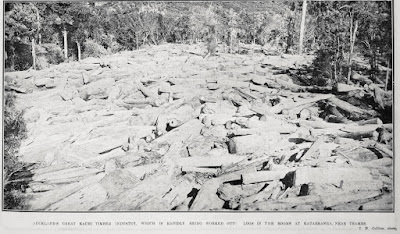 Showing kauri logs collected by the Kauri Timber Company's booms across the Kauaeranga River at Parawai. AUCKLAND'S KAURI TIMBER INDUSTRY: A CORNER OF THE BOOMS ON THE KAUAERANGA RIVER. PREPARING A RAFT OF LOGS IN THE KAUAERANGA RIVER, THAMES, FOR TOWING TO AUCKLAND. AUCKLAND'S GREAT KAURI TIMBER INDUSTRY. WHICH IS RAPIDLY BEING WORKED OUT: LOGS IN THE BOOMS AT KAUAERANGA. NEAR THAMES. Booms Flat Campsite, Kauaeranga Valley. Historic Kauri Dams, Kauaeranga Valley. Kauri Timber Industry - Kauaeranga Valley by Gary Staples. Ohinemuri Journal.